By Brother Henry F. Simonds. Richard C. Maclaurin Lodge, A. F. & A. M., a Lodge unique in the annals of North American Masonry, if not in the world, commemorated its Fiftieth Anniversary on November 3, 1970. This Lodge is unique because, technically, it is the first of the so-called College Lodges in the United States. Since its founding in 1920, several other College Lodges have been constituted, following the example that had been set, namely, limiiing the membership to those directly connected with the institution. Among such Lodges are The Harvard Lodge and Boston University Lodge. The history of the founding of this Lodge makes an interesting chapter in Masonic history. In true Masonic tradition, the credit for founding the Lodge belongs to no one man, but is a concrete example of cooperation of many. It appears probable that the idea of a college Masonic Lodge, as distinct from a college fraternity of students already members of the Craft, such as Acacia, was conceived by Brother E, Russell Hubbard. Brother Hubbard, already a member of Dalhousie Lodge in his home town of Newton, Massachusetts, was the first signer of the application to the Grand Lodge of Massachusetts for a charter for Richard C. Maclaurin Lodge. Knowing of Professor Frank Vogel's Masonic application as a life member of the Grand Lodge and also being acquainted with him outside as well as within the classroom, Brother Hubbard suggested the idea to him. Professor Vogel thought well of the suggestion and henceforth devoted a major portion of his time and efforts to bring the proposed Lodge into being. Credit lies also with the "Masons of M. I. T.", a club founded at Tech about 1919. This club consisted of about one hundred Masons at the Institute, with Brother A. Edward Tuttle as president. It was within this club that the idea of a Tech Lodge was fostered and grew. In the fall of 1920, with about one hundred-fifty Masons then at Tech, a petition was drawn up by Professor Vogel, Edmund G. Farrand, then president of the Masonic club, and Robert R. Litehiser, Secretary. Through their efforts, eighty-one signatures were secured for the petition. Thirty of the petitioners were faculty members or employees of the Institute and the remainder were students. Active support and encouragement was also extended by Worshipful Brother Charles Hille, Past Master of Amicable Lodge, together with other Masons of the Cambridge Second Masonic District. It followed very naturally that the Lodge should be named for Richard C. Maclaurin, during whose regime the new buildings were erected in Cambridge. He was largely responsible for raising money for the construction of these buildings and had passed away just previous to the founding of the Lodge as a result of the overwork entailed in the building campaign. Worshipful Brother Maclaurin was a Past Master of Aorangi Lodge, Number 2300, English Constitution in Wellington, New Zealand. He entered on April 23, 1901, passed June 25, 1901, and was raised on August 27, 1901, holding Grand Lodge Certificate Number 1297. Aorangi Lodge was then a small but closely knit group of thirty-six members of which Worshipful Brother Maclaurin became Master four years after his initiation. Having served only one year as Warden, special dispensation was granted from the Grand Master of the Grand Lodge of England to install him as Master. The petition with its eighty-one signatures was presented to the Grand Lodge in the same manner as it would have been for any other Lodge, there being nothing in the Grand Lodge Constitutions at that time regarding college Lodges. 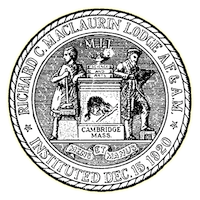 The approval of the other Lodges in the Cambridge Second Masonic District was necessary, and readily given, as it was understood that Richard C. Maclaurin Lodge would restrict its membership to the Massachusetts Institute of Technology. This is the basis of the claim to precedence as a college Lodge, as the Lodge was, in fact, by agreement a college Lodge before the Grand Lodge Constitutions were amended to recognize such. The petition received the approval of [http://www.masonicgenealogy.com/MediaWiki/index.php?title=GMPrince Arthur D. Prince', then Most Worshipful Grand Master of Masons in Massachusetts. He designated Right Worshipful Guy Holliday, then District Deputy Grand Master for the Cambridge Second Masonic District, later to become the first Master of The Harvard Lodge, to institute Richard C. Maclaurin Lodge on December 15, 1920. Of the eighty-one charter members, twenty-eight were obliged to withdraw after the Lodge was constituted on November 19, 1921. Most of them came from States whose Grand Lodges did not permit dual membership and so had to withdraw when the charter was granted. These Brothers lent their support to the establishment of the Lodge and supported it during its years of dispensation. All honor to them and many thanks. The first class of candidates to receive the Entered Apprentice degree in the Lodge was: Frank C. Vogel, Philip E. Haebler, Maurice W. Williams. Professor Vogel, as first Master of the Lodge, had the rare and unusual experience of raising his son as the first candidate in the Lodge. He remained in close and active contact with the Lodge up to the time of his death in 1932. At that time he was in the midst of events connected with the George Washington Tercentennial as a member of the Massachusetts Committee appointed by the Governor. The Lodge officers, under Right Worshipful Brother Hokanson, then Master of the Lodge, officiated at the funeral services for Professor Vogel, conducted in the Temple of Lafayette Lodge, his home Lodge in Roxbury, Massachusetts. Professor Vogel was born March 15, 1863 in Boston, Massachusetts. Entered Lafayette Lodge February 8, 1904, passed March 7, 1904 and raised April 16, 1904. He was Master of Lafayette Lodge in 1911-1913. He was a member of Mount Vernon Royal Arch Chapter in Roxbury, Illustrious Master of Roxbury Council of Royal and Select Masters, 1913-1914, member of Joseph Warren Commandery in Roxbury. He was a charter member of Euclid Lodge, Boston, an affiliated member of Germania Lodge, Boston and an affiliate member of The Harvard Lodge, Cambridge. He was acting Grand Secretary of the Grand Lodge of Massachusetts, 1914-1915 and Deputy Grand Master of the Grand Lodge of Massachusetts, 1916. He was a member of all Scottish Rite Bodies in Boston, and last, but not least, a founder and first Master of Richard C. Maclaurin Lodge in Cambridge, 1920. He died June 9, 1932. The first meetings of the Lodge were held at Odd Fellows Hall in Central Square, Cambridge, then, as now, on the third Wednesday of each month. Generally there was a special meeting on the first Wednesday in the month. The first Master and Wardens were experienced Masons from the faculty. Professor Vogel's background has already been mentioned. Worshipful Brother Bush, then in the West, strengthened the Lodge with his past experience in the line of Robert Lash Lodge of Chelsea. Worshipful Brother Timbie was in the Junior Warden's station in the South. Worshipful Brother Weysse in the Senior Deacon's station served the Lodge well with his extremely accurate ritual. Brother Charles V. Briggs organized the instruction committee which met in a classroom at the Institute at odd hours. He taught not only the candidates, but the instruction committee as well. Brother Winwood Prescott, as Chaplain prepared the special charge given for many years in Richard C. Maclaurin Lodge. During the first year of dispensation, a set of lights were presented to the Lodge by Amicable Lodge. At the March meeting of the Grand Lodge of Massachusetts in 1922, the Grand Lodge Constitutions were amended to give college Lodges concurrent jurisdiction over the students, faculty and employees of the college with which they were affiliated. Prior to that time Richard C Maclaurin Lodge had to secure release of jurisdiction for almost every candidate. The first Secretary was Captain Howard F. Clark, who was followed on his transfer by Sergeant Robertson, also of the Military Service Department. Upon Brother Robertson's transfer, Worshipful Brother Leicester F. Hamilton took over and was followed by Worshipful Clifford E. Hentz until 1933 when Right Worshipful Wolcott A. Hokanson was elected as Secretary and held the office continuously for thirty-five years, until his retirement in 1968. The Lodge met at Odd Fellows Hall until 1929 when the financial situation became such that it became possible to move to the North Cambridge Masonic Temple. The first initiate of the Lodge to be installed Master was Worshipful Brother Clifford E. Hentz who was installed eight years after the Lodge was founded. The second twenty-five years of Richard C. Maclaurin Lodge, A.F. & A.M. have been characterized by further successes. The following is a compilation of highlights of interest about people and events during these second twenty-five years. The Second Quarter Century opened in 1946 with an increase in the initiation fee. Our present Grand Master, Most Worshipful Herbert H. Jaynes, then Master of Belmont Lodge, visited our Lodge for the purpose of obligating one of the candidates of Belmont Lodge. During this and the next year the Lodge was treated to a number of lectures: by Dr. Schmidt of the MIT Biology Department on the Electron Microscope; by Brother Colonel Demming on the Philippines; a color movie of a Newport-Bermuda yacht race by Bro. Walter C. Wood; by Bro. Harold E. Edgerton on night photography; Bro. James H. Wagstaff discussed English Lodges and Bro. B. R. Manickam spoke on Masonry in India. The Worshipful Master for 1947, Wor. Carl M. F. Peterson, presented the Lodge with a deer which was turned into a venison stew dinner by the MIT Walker Dining Service. It was followed by a talk by Professor E. E. Lockhart of the MIT Food Technology Department. The next few years of the Lodge's history were relatively calm. There were only four lectures between 1948 and 1951. Brother Keith W. Robbins spoke about Korea; Wor. Ernest H. Huntress gave a talk about his trip to Norway, illustrated by his colored slides; a world traveler and our Lodge's Historian, the late Bro. Henry F. Simonds, spoke on his travels and visits to other Lodges around the world and our Lodge was entertained with a zither concert by Bro. H. A. Wayringer. Wor. Fredric H. Hartwell and Wor. Kenneth Cass Reynolds were elected to honorary membership. The Lodge also took part in the 1948 Pilgrimage to the Masonic Home and Hospital. No history of the Lodge would be complete without mention of the charge to newly raised Master Masons given by Wor. George Owen for many years. The next two years, 1952 and 1953 saw many things happen. There was a joint meeting between Richard C. Maclaurin Lodge, The Harvard Lodge and Boston University Lodge. MIT "Tech" Chapter, Order of DeMolay, sponsored by our Lodge, held its first meeting. The Aleppo Temple Chanters and Third Degree Team presented both the after dinner entertainment and the work of the evening at the January 1952 meeting. Rt. Wor. Willard P. Lombard and Rt. Wor. Arnold F. Thomas were elected to Honorary Membership. There was one speaker of note, Bro. Ralph Lowell, who discussed "The Way to Prevent Inflation". Evidently not enough people took his advice. The archives of the Lodge received facsimile copies of two very important Masonic documents as a memorial to Bro. George W. Brown, a facsimile copy of the records of Fredricksburg Lodge No. 4 of Virginia, showing the initiation, passing and raising of George Washington in 1752-1753 and a facsimile copy of the Holy Bible on which he was made a Mason. The traditional Ladies' Night began in 1954 at the MIT Faculty Club as an Annual Dinner and Dance. The archives received a 1954 Alumni Day Maclaurin Stein. During the Blood Drive that year, the Lodge had to have dinner at a restaurant across the street; the banquet hall was full of donors. At the 1955 convocation of The Harvard, Boston University and Richard C. Maclaurin Lodges, Wor. Charles V. Briggs was recognized as a member of all three Lodges. A young visitor from Malta Lodge in Grand Rapids, Michigan, Wor. Williams, 92, spoke of his years in Masonry and of the difference between Illinois and Massachusetts ritual. In a not too well publicized decision, the Lodge approved remission of dues for members inducted into the Armed Services. A Table Lodge honored Rt. Wor. Wolcott A. Hokanson in 1957. (Wor. later Rt. Wor.). William H. Carlisle, Jr. was installed as Master and Wor. Robert J. Radocchia was installed as Junior Warden of the Seventh Lodge of Instruction. A Table Lodge was held to honor Wor. Vannevar Bush in 1958. Most Worshipful Whitfield W. Johnson spoke and "The After Dinner Mints" provided the entertainment. Bro. George Fuld, one of the World's leading numismatists, lectured on Masonic Coins of the Colonial Era after one of the meetings of that year. Richard C. Maclaurin Lodge placed first in the District in the Red Cross blood drive and received a set of flags denoting that honor. A Vesper Service of the Cambridge Second Masonic District was held at the MIT Chapel with the Lodge Chaplain, Rev. Bro. Donald H. Baker, conducting and with Wor. David P. Mason as soloist and Wor. Philip Richardson as organist. In 1961, Rt. Wor. Wolcott A. Hokanson was presented with the Joseph Warren Medal by our own Past Master, the District Deputy Grand Master for the Cambridge Second Masonic District, Rt. Wor. William H. Carlisle, Jr. for distinguished services to the Lodge and to the Masonic Fraternity in general. Rt. Wor. William H. Carlisle, Jr. was honored at a Table Lodge in 1962. Rt. Wor. Lorenzo B. Carr was honored by a Table Lodge in 1963. He was also elected to Honorary Membership in the Lodge. Bio. John S. Saloma received the DeMolay Legion of Honor Award and Wor. Vannevar Bush was presented his 50-Year Veteran's Medal by Rt. Wor. Roger Winslow Jones. Because of a severe snowstorm, one of the 1964 Lodge Meetings was postponed, a first for the Lodge. But, to make up for it, that year saw a Charter Members' Night. The November Meeting in 1967 looked like a repeat of 1964, but perseverance paid off and four Master Mason Degrees were conferred with Members and visitors alike taking part. 1968 saw a Table Lodge to honor Wor. James Holt, Past Master of our Lodge, a tribute to his many years of service to the Lodge as Treasurer. The "1967 Gavel Club", Masters of Lodges from the Greater Boston Area came to our Lodge to raise one of our Members to the Sublime Degree of Master Mason. In 1969 Bro. Samuel Solomon Baker, who had attended Richard C. Maclaurin's first meeting, was elected to Honorary Membership. Through the last twenty-five years Richard C. Maclaurin Lodge has continued to grow and today has a membership of 4-15 members. Wor. Vannevar Bush—Master 1922; honored by a Table Lodge April 28, 1958; Presented his SO-Year Veteran's Medal November 20, 1963. "The Yankee Inventor" has served with great distinction on numerous Governmental and Academic Committees. He has served our Fraternity, The Massachusetts Institute of Technology and the United States Government with courage, determination and faith. Rt. Wor. Wolcott A. Hokanson — Master 1932. Secretary of Richard C. Maclaurin Lodge 1933-1968; District Deputy Grand Master, Cambridge Second Masonic District, 1943-1944; Grand Standard Bearer, Grand Lodge of Massachusetts, 1954; Honored by a Table Lodge April 30, 1957; presented the Joseph Warren Medal September 5, 1961; one of the founders of the Tech Chapter, Order of DeMolay 1952. A Brother who has given countless hours of devoted service, not only to MIT as Bursar, to many other Masonic Offices, but to the Fraternity in general. His is truly an example of one's devotion to Mankind. Rt. Wor. William H. Carlisle, Jr. — Master 1952; one of the founders of the Tech Chapter, Order of DeMolay 1952; Senior Grand Deacon, Grand Lodge of Massachusetts, 1955; Master, Seventh Lodge of Instruction, 1957-1958; Honored by a Table Lodge March 21, 1962; District Deputy Grand Master, Cambridge Second Masonic District, 1961-1962. Many words have been spoken and written about this most distinguished Mason. His was an instructive and inspiring Masonic career. He brought his love of people, leaching and understanding into his Masonic life and service. He served his Brethren with dignity, honor and selfless devotion. Wor. James Holt — Master 1944. Our beloved Treasurer for many years. His devotion to Richard C. Maclaurin Lodge, its Officers and Members will long be remembered. To Wor. James Holt the Brethren expressed their affection and sincere appreciation for his years of service by honoring him with a Table Lodge on September 18, 1968, an honor richly deserved. Wor. Harold H. Carter — Master 1961; Master of the Seventh Lodge of Instruction 1966-1967. This Brother has served with untiring devotion, not only as Master of our Lodge, but as its Chaplain. His contributions to the Blood Bank, both as a donor and as Chairman of the Blood Committee have been unequaled. No history of our Lodge would be complete without bringing to the notice of the members the service to the Lodge by our Organist, Bro. George W. Collins. His years of musical service number forty. Brother Collins was honored by the Brethren with a Table Lodge September 17, 1969. May he continue in his musical Station for many more years to come. We shall meet upon the level there. Though our trials be severe. This page was last modified on 12 December 2016, at 13:19.